There has been a lot of buzz lately both in the social as well as the mainstream media, fully supported by the government that there is massive investment spike in green energy. A large number of articles were written on how turning to green energy is great and how it will help save the planets. The media even used the examples of the west ramping up their development of green energy to back their claims which went along the lines of “if white man does it, it must be good for the world”. Of course, the western countries which were at the forefront of the climate change and green energy debacle went on to complain how developing countries like India and China should reduce their emissions even though the per capita emissions by Indians and Chinese are just 1/30th of that released by their counterparts in the western developed countries. But recent data has shown that the same western countries, which were sanctimonious on how they will save the world with green technologies are now scaling down their investments in the area while the developing countries are investing more and more even though most of the green energy sources are not viable economically or practically. For example solar power is still insanely costly, even if one accounts for “free sun” because of massive maintenance (like replacing the panels when they break down) and easily cost twice or more than the average coal or other fossil fuel or nuclear fuel generated power depending on the area they are used. Another problem with most of these green energy sources are that it is a vastly unreliable source of energy. For example, the energy generated by solar power, even if one ignored the cost, won’t be available 24 hours a day nor will it be available all days in the year. Even if solar energy manages to provide for the day light and during summer, conventional sources of power will have to be used for night and for time when the solar energy is not available. That is, if the Indian energy needs per hour are about 100GW, if one goes fully solar energy generation, then Indians have to bear with no light or electricity at night and live in dark ages or add an additional 100GW hour capacity of conventional energy generation capacity like coal or nuclear energy. So in essence, the total investment needed for meeting the energy needs would be twice the amount if the countries go completely green, instead of using conventional sources of energy like coal or nuclear energy or buy it from neighbours. Is it something a poor developing country like India can afford? Even though this example assumes 100% green energy generation, this will still be the case across all manners of electricity generation i.e. 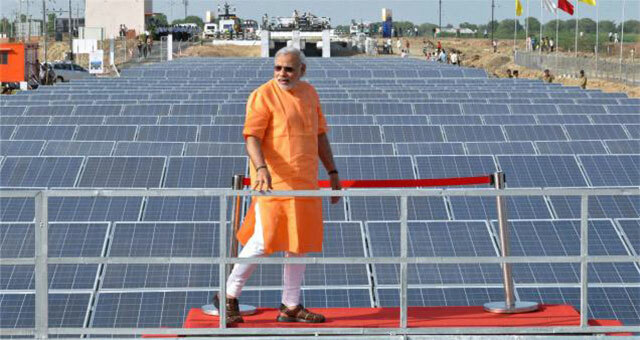 if government needs to generate 100GW for a hour to satisfy the need of the consumers and if it invests 20GW in solar energy and 80GW in the conventional sources of energy, then it will need to invest additional 20GW of conventional energy like coal for matching the demand of 100GW during winters, night and other times when the sun light is not enough or not available. So in essence, any investment in green energy is a double whammy for cost and is something which is NOT usually considered when one simply compares the price of conventional and green energy sources. The same is true with wind energy as well. For example, in Tamil Nadu, the installed capacity for power generation is about 4GW but the actual power generation varies from 2GW in the monsoon season to 0GW in the the hot dry windless winters and summer season. So the state experiences acute shortages during the non windy seasons resulting in 1-2hrs of power cuts daily, though on paper the installed capacity of generation would make it seem as if Tamil Nadu is a energy surplus state. Read about some of the problems caused by these unstable power sources here. Western countries being expert at selling snake oil have understood this very well and are slowly giving up on their quest for green energy as can be seen from the graph above. They are now scaling down their production and investment in the green energy, now that the developing world has eaten up an digested their green tree hugging environmental nonsense completely and are doubling up the investments in this unproven, uneconomical and unreliable sector. Of course, unlike the easily brianwashable Indian masses, who would take everything they hear from western men at face value and follow ideas which harm themselves, the west does not follow anything without some benefit for themselves. That’s why they have started to scale down their investment in green technologies, now that the green technologies are proving to be too costly for their tastes and their agenda of preventing rapid industrialisation of developing world has been cut down in the name of environmental protection. The same western government and their NGOs fund the anti-dam protesters in Narmada project in the name of environment and ecosystem and others, while they do nothing to fix their own ecosystem and environmental issues. Seriously, shouldn’t the Indians who follow their logic that dams cause environmental damage think for themselves why the western societies which fund these NGOs never destroy their own damns? If ecosystem is so important, isn’t it easier to just destroy their own dams, instead of preventing construction of the dams in developing countries? The developed world doesn’t have the abject poverty of Indian masses to worry about irrigation and electricity generation and hence should have no problem in destroying their own dams to save the river ecosystem right? At least India should feed and power its poor population and hence dam construction is essential to provide irrigation for agriculture and electricity generation but what reason does west have in not protecting its own environment? Isn’t the availability of basic electricity in 2016 to the poor more important than the adventures in energy generation and hug the trees syndrome? Now that west has clamped down its investment in the green energy generation, having successfully brainwashed the developing world into focusing their energy into an unproven energy source, they will be free to do what they want, unchallenged for a few more decades, before they engineer a new crisis to stop industrialisation in developing countries. If the west is so interested in green energy, shouldn’t it start at home? Being richer countries, won’t they be able to afford to bear the higher cost of green technology more? So why should developing countries bear this cost of green energy development and generation to save the planet when the nations responsible for the green house gases for the most part now and historically are going backwards on their promises? Will India and the other developing countries learn from the west and try to at least put their own interest and societies, which they have a dire need to feed, ahead of the propaganda from the tree hugging hippies of the west? This is however not to suggest that green energy is bad. India should adopt green energy or indeed any kind of energy, only if it is economically viable and helps pull economic development faster and industrial development quicker. Indians should not base their economic decisions and the life of 600 million poor on emotional speculation on green energy but rather on cold hard facts based on objective analysis. Once no one in India has to worry about daily food and basic amenities, India can start thinking about saving the world. But till then let the white men enjoy this Green House Gas burden. ← Does Hasan Suroor deserve to be acquitted from the charge of sexually grooming a 14yr old?